New Saab 9-3: Dynamic Looks Showcase Uprated V6 and 'XWD' All-Wheel Drive Technology Detroit -- The new Saab 9-3 range features bold, more assertive looks, reflecting powertrain improvements that include the introduction of all-wheel-drive and more powerful gasoline engines. The distinctive frontal styling, inspired by Saab's award-winning Aero X concept car, is designed to reinforce the range's sporty appeal. For the U.S. market, it heralds the introduction of an uprated 280 hp (206 kW) 2.8 V6 turbo gasoline engine. The advanced all-wheel-drive system (Saab XWD - 'cross wheel drive') is exclusive to 9-3 Aero Sport Sedan and SportCombi models. It features innovative developments in wheel slip management and, as an option, the use of an electronically-controlled rear limited-slip differential. The new 9-3 range is visually distinguished by all-new bodywork forward of the A-pillar, with new bumper moldings and light assemblies front and rear, as well as new doors and handles for the SportSedan and SportCombi. Flared side sill extensions become standard across the range. All these elements combine to give the car a clearer Saab identity and a bolder, more assertive stance. For the Sport Sedan, for example, 70% of the external body panels and parts are all-new. The styling strategy brings together contemporary and classic Saab design themes in a progressive, modern expression of the brand's distinctive character. The deeper, more prominent evolution of the Saab grille adopts a theme first seen on the Aero X concept car. This is complemented by all-new headlamp lenses and light units that now incorporate a thin 'eyebrow' lighting zone designed as a brand specific 'signature' feature. These wraparound units culminate in an upswept rear edge, introducing a Saab design theme from the 9-5 range and classic 900 model. The grille's central wing motif, referencing Saab's aircraft heritage, is, of course, retained. The new look sees the adoption of another Saab signature feature: a 'clamshell' hood, closing across the top of the front wings. The hood pressing incorporates a sweeping, U-shaped styling line, as first seen on the Aero X, which echoes the curvature of the windshield. The swept-back frontal lines are complemented by a front bumper and splitter assembly with a deep, trapezoidal air intake, even more pronounced on Aero versions. This is flanked by deep black vents which are framed, like the grille, in a matte chrome finish. As with the Aero X concept, these represent a metaphor for the intakes of a jet engine. At the rear, all new 9-3 models now feature smoked white light clusters. The new bumper moldings are much deeper with curved, uninterrupted surfaces. The trunk lids of the Sport Sedan and Convertible are also altered to accommodate a new matte chrome life handle trim with an integrated badge, similar that on the SportCombi. The removal of all external rubbing strips from bumpers and doors (color-keyed on the Convertible) contributes to a cleaner and more cohesive overall appearance. New door panels now adopt a simple, uncluttered form with redesigned and color-keyed handles. The sill extensions are visually integrated front and rear with the scalloped corners of the new bumper moldings. Other external enhancements include the introduction of flat wiper blades, for reduced wind noise, and new alloy wheels. Two new colors are added to the range, including a Snow Silver metallic paint finish similar to that seen on the Aero X. The active, all-wheel-drive system (Saab XWD) is designed to optimize handling and stability in all driving conditions. It is offered on Aero versions of the 9-3 Sport Sedan and SportCombi, in combination with an uprated 280 hp (206 kW), 2.8 V6 turbo engine which delivers almost 15% more maximum torque (400 Nm) to exploit the greater traction available. It comes with a choice of six-speed manual or automatic transmission. This state-of-the-art system includes two innovative features: pre-emptive engagement of the rear wheels to optimize traction at take-off; and an active rear limited-slip differential (eLSD), allowing variable torque transfer between the rear wheels. Saab XWD is a fully automatic, on-demand system capable of sending up to 100% of engine torque to the front or rear wheels whenever necessary. While offering new Saab 9-3 Aero owners sure-footed handling in low-grip conditions, its sophisticated operation also adds a further sporty dimension to the driving experience in all road conditions. Fine balancing of the drive torque between the front and rear axles raises the threshold at which ESP throttle and braking interventions are triggered, providing more scope for closer driver involvement. The system is governed by its own electronic control unit, which functions in harness with the engine, transmission and ABS/ESP control modules. The hardware consists of a Power Take-off Unit (PTU) in the front final-drive that transmits engine torque through a prop-shaft to the Rear Drive Module (RDM). This incorporates a Torque Transfer Device (TTD) and an optional electronically-controlled Limited Slip Differential (eLSD). Both are wet, multi-plate clutch units from Haldex. At take-off from rest, the TTD is initially activated when the clutch plates are forced together under hydraulic pressure, thereby engaging the RDM. This pre-emptive function is a valuable improvement in current technology, which requires the detection of wheel slip before the TTD is activated. For the driver, the enhanced functionality gives maximum traction immediately for smooth, strong acceleration from rest without the possibility of any initial hesitation. On the open road, drive torque is seamlessly and continuously varied between the axles by the control of a valve in the TTD, which increases or reduces the pressure on the wet clutch plates. When cornering, Saab XWD rewards the driver by providing enhanced, more finely balanced chassis dynamics. Data from the vehicle's ABS/ESP sensors - measuring wheel speed, yaw rate and steering angle - is utilized, and careful programming of Saab XWD enables the application of rear drive to balance oversteer and understeer characteristics, improving stability and roadholding. In highway cruising conditions, when traction or optimum grip is not an issue, only 5% to 10% of engine torque is typically transmitted to the rear wheels. This helps provide the driver with a measure of greater stability, while helping to save fuel. The ultimate 'icing on the cake' with Saab XWD is the eLSD option. This is the first application of an electronically-controlled, rear limited slip differential in this segment of the market. The eLSD is installed alongside the RDM and operates via pressurized clutch plates on a principle similar to the larger TTD. In icy or wet split-friction conditions, for example, it uses inputs from the rear wheel speed sensors and can transfer up to 40% of torque between the drive shafts, to whichever wheel has more grip. The eLSD also gives the driver enhanced control when cornering hard or completing a high speed maneuver, such as a lane change, by momentarily applying more or less torque to either of the wheels to help the rear of the car more closely follow the direction of the front wheels. This yaw damping effect can keep the car better balanced and more tightly controlled, without requiring 'outside' intervention from electronic stability aides. Installation of Saab XWD includes the fitment of a new rear sub-frame to carry the RDM, revised rear suspension geometry and new wheel hubs for the drive shafts. The three piece prop-shaft runs through two bearings with constant velocity joints for smooth running with minimal 'wind-up'. Wheelbase and rear track dimensions are unaltered. 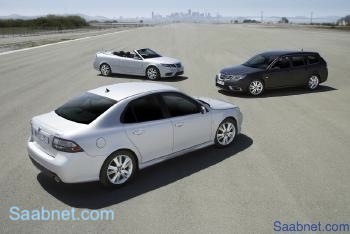 Saab XWD will be available from the beginning of next year. Sport Mode standard for automatic transmissions. This can be selected via an instrument panel button and aligns gear selection more closely with the intentions of the driver. If the driver momentarily lifts of the throttle, the current gear will be held for more effective engine braking and a quicker acceleration when required. During braking, downshifts are also faster and more closely matched to the rate of vehicle deceleration. Optional cornering bi-xenon headlights provide improved vision. The steering-linked bulbs can swivel up to 15 degrees when negotiating a bend or corner above 15 kph (9 mph). In highway driving above 110 kph (69 mph), the low beam is also automatically raised slightly for improved illumination. For the new 9-3 Aero XWD models, the current 2.8-liter, 24-valve V6 Turbo engine is uprated to 280 hp (206 kW) and 400 Nm maximum torque. This has been achieved to by increasing available boost pressure from 0.5 to 0.8 bar. It gives the Sport Sedan projected zero to 100 kph (96 mph) acceleration in 6.3 seconds and 80 (50 mph) to 120 kph (75 mph) (fifth gear) in 7.9 seconds. The advanced specification includes: a lightweight, all-aluminum construction; variable inlet valve timing; a twin-scroll turbocharger and hydroformed exhaust manifolds with stainless steel liners and air injection for improved cold starting. In two-wheel drive applications, this engine now offers a 5 hp (4 kW) increase in maximum power, to 255 hp (188 kW). Tire Pressure Monitoring (TPM). This warns the driver if pressure in any of the tires drops below the recommended level. Sensors in the valves initiate a radio signal and a warning message is illuminated in the main instrument display, indicating which wheel(s) has lost pressure. TPM is standard on all new 9-3 models for the U.S. market. Bose Centerpoint Surround Sound audio. Available as an option on all Sport Sedan and SportCombi variants, this offers exceptional reproduction quality through five channels from CD, MP3 or XM digital radio sources. Surround sound quality is automatically provided even if a CD is not encoded for it. With 11 (Sport Sedan) or 10 (SportCombi) speakers, performance is optimized for the acoustic requirements of each passenger cabin.